Calling deer can be the most fun part of deer hunting. I would never go into the woods without a grunt call. I believe that if a hunter is careful, a deer call will never hurt your hunt. The golden rule is that you never call to a deer if it is looking at you. This is where most hunters blow their hunt. 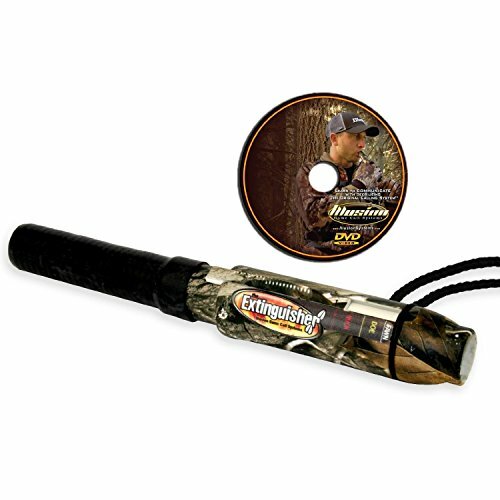 Deer calls are some of the most bought out items for deer hunting. Calls are also one of the most underused tools a bow hunter has. The reason is that we don’t know really how to use them. As a hunter we all have had the situation where there is a deer responding to the call and then the call makes a strange sound as we use it. The deer runs off and we swear never to use a call again. This is were the Extinguisher comes in. The Extinguisher is a doe call. Most hunters know what a grunt call is but most hunters don’t even think about a doe call. A doe call is as important as a grunt call. A buck may not want anything to do with a nether buck but a doe is a different story. Doe calls will also work on does whereas a buck call will do nothing to bring in a doe. Many times when calling in a doe the buck will flow them right to you. The good people from Illusion Systems sent us their deer call named the Extinguisher. This call is an all-in-one verbal call. It’s a Fawn, Doe and Buck call in one. It allows you to change the tone of the call. This will allow you to make it sound like there are more then one deer. The way that this call does it is by moving the slide on the side of the call. This gives you the ability to change the call very fast to see what the deer will respond to. I have bought some great calls before but I was always unsure about the kind of sounds that I should make with the call. We all know that we need to blow in the call but not sure how often, or hard, or when to make those calls. The Extinguisher has a CD that comes with all their calls. You can play the video on the CD on your computer, or listen to the audio track in your CD player, and they also have the video on their web page. This CD has a lot of instruction to give you the knowledge to use the call. As they say on their product’s description, “Learn the entire whitetail deer language“. Pretty bold statement, but they deliver on it. After playing the CD at home, and after listening to it for a second time in the truck on the way to the hunt, I had a really good picture of how the call should be used. This year the weather has been really hot so I have not seen a lot of deer. But I had some does come into the call and just seeing deer can make a hunt worth the time. I have had this call in the woods now for a few weeks and I have been putting it through its paces. The one thing that I like about this call is how easy it is to get the reed unstuck. All you have to do is move the slide. I have always been a strong believer in calls. It doesn’t mater if it is deer, turkeys or ducks, calls are a must. The key to any call is not to over-call. When things are slow it is nice to do some blind calling. The problem with blind calling is that the animal could walk up to you without you seeing it. The Extinguisher call got great reviews from the North American Hunter Club. Our of 222 pieces sent to NAHC, 221 came back approved by the members. I have been using this call for three weeks in the woods. After watching the video well and following the instructions, I too was able to call in some does.